We are big snackers in our house but our resolution was to eat healthier snacks this year! So far we have been doing a lot better and we really focus on eating real, unprocessed and healthy foods for snacks. That includes eating a lot of nuts and some of our favorites are almonds and pistachios! My children have fallen in love with Pistachios and they beg for them every snack time. Our favorite brand is Wonderful Pistachios because they are non-GMO and offer out-of-the-shell pistachios that make it easy to snack on and convenient for busy moms like me! 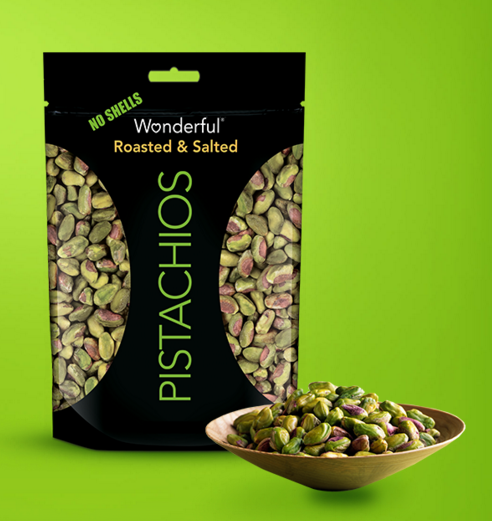 Roasted to perfection with just a touch of salt, our out-of-the-shell pistachios are ideal for cooking and baking, and still wonderful for snacking and entertaining. And my son LOVES when I send them in his lunch! They make the perfect snack for his lunch box - they keep him energized and fuller longer without taking up too much room in his lunch box! 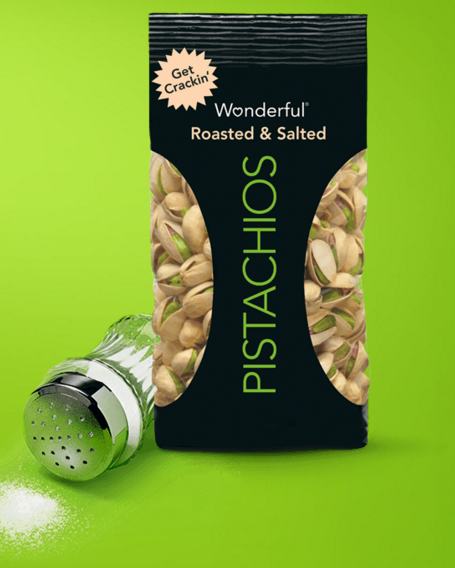 Wonderful Pistachios come in a variety of flavors including Sweet Chili, Roasted & Salted, and Salt & Pepper. They also come in convenient 100-calories packs (Non-GMO) that are perfect to fit in your child’s lunchbox. Another great snack idea for lunch boxes and snack times is Wonderful Almonds which are also both nutritious and delicious! 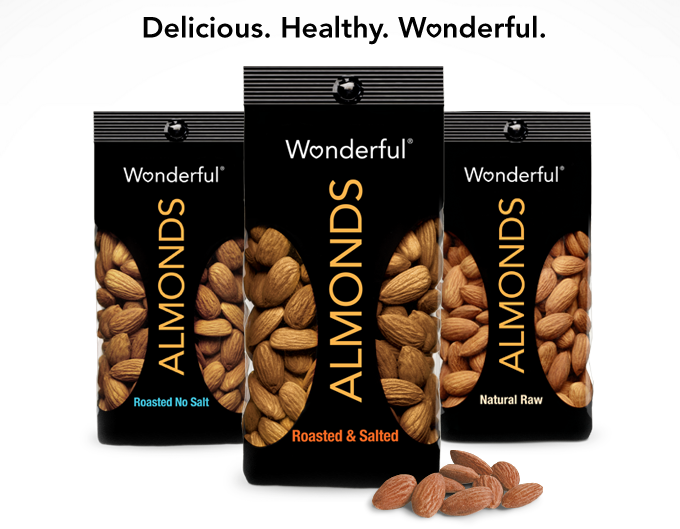 Wonderful Almonds comes in three varieties - Roasted & Salted, Natural Raw and Roasted No Salt. Each variety is great for snacking, recipes and for lunch boxes and snack bags. They have a great crunch and are filling and so healthy! I eat them plain, stick them in baked goods and I can't wait to make some cinnamon sugar almonds as a special sweet treat! Nuts are the ideal replacement to greasy potato chips and will keep students (and parents!) full longer, leaving more time for students to enjoy their day! You can purchase Wonderful Almonds and Pistachios at a retail store near you. The Wondeful Company is generously offering (1) Wonderful Prize Pack including 10 packs of wonderful Pistachios and 10 packs of Wonderful Almonds in the lunchbox perfect size, plus 10 bottles of FIJI Water to a lucky winner! I did not rate you on TMB as intended (I did vote) because YOUR link from this page does not - as it used to - go to the rating page. Now it just goes here: http://www.topmommyblogs.com/details/moachs/ and I can not figure out how to go from that page to the page to rate you. Please let me know! Thanks for your feedback! Yes, with the new Top Mommy Blogs website it is a little harder to leave a comment. In order to leave a comment, you can either search for The Review Stew in the search box on the top right corner or just go to the second page of blogs and I am currently #36. Once you find my listing, you can then click on comment as you did before and leave a comment! I truly appreciate and love reading each and every comment so I thank you so much for leaving me one! I read every single comment that is posted on there and reflect on all feedback that I receive! Hope this helps! :) Thanks for visiting and rating us! Well, ok, but leaving a comment on TMB is not a rating. I can see where to do that. So, please don't think me very stupid, but I don't see how that helps. Again, please advise. Sorry I misunderstood your question. Rating is the same thing as voting and that can only be done by clicking on the banner on my site. When you click on the banner/button for Top Mommy Blogs on my site, a new page will pop up that asks you on the left side if you want to vote or on the right side if you just want to visit the Top Mommy Blogs site. If you want to vote/rate us on Top Mommy Blogs, click on the left side of the page and then it will confirm on the next page that you voted! You can only vote for us once a day. The more votes we get, the higher we are ranked. So you can't personally rank us, you can only vote to increase our rank. So when you voted, you helped rank us and you did everything correctly! Thank you!